Sarah Palin saying "Of course" she's interested regarding running for the presidency in 2016 has people buzzing. http://abcn.ws/1xPVFhj During that interview, Palin said we need a candidate who is ready for Hillary. I agree. Romney would be Mr. Nice Guy/gentleman unwilling to attack the girl. 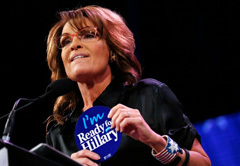 As for Palin running, a woman wrote: "I have never given up on her (Sarah Palin). I am sooooooo hoping that she will be our spokesperson. My husband says the press and Obama have tainted her so much that it would be impossible for her to run. I say that 'with God, all things are possible." So tell me folks, how many politicians on our side truly are who they say they are; standing up for our principles and values – fighting for freedom and the Constitution? We lament that many politicians on our side are obsessed with winning an approving pat on the head from the MSM; reduced to political impotence. Oh if only there was a little blue pill for dis-functioning Republicans/conservatives. Palin has proven that she does not give a rat's derriere about what the MSM thinks of her. We pray for a voice on the big stage with the guts to stand up for Conservatism. Sarah Palin fills the bill in spades; one of the few unafraid to get into Obama's grill. I love it!Unapologetic to the Left (Democrats, Hollywood and MSM) Palin's attitude is, "Say it loud. I'm conservative and proud." Not too long ago, a conservative savior arrived on the seen, exciting and inspiring millions. I remember being on the Tea Party Express national tour bus. We kicked off the tour in a dust bowl, Searchlight, NV with Sarah Palin as our headliner. Twenty five thousand people showed up, many camping out days ahead to reserve their spot. I witnessed the moving scene of seniors who had to park almost a mile away approaching the event using walkers; all coming to see their Sarah. The Left launched an over the top viscous shock and awe champion to crucify Sarah Palin, her family and her disciples. When the Left sought after Palin supporters, sadly, many cowardly said, "I never knew her." There is something deja vu about this scenario. So, Palin courageously comes along and does everything patriots have been longing and praying for someone to do. Her reward is patriots distancing themselves from her. Classy. Real classy. Howard Stern idiotically blamed Palin for the AZ shooting and called her a "F***er and a c***!" Despite the Left's best efforts to humiliate and destroy her, Palin has hung tough, remaining faithful to the mission of the Tea Party; the preservation of our freedom, liberty and culture – traditional conservative principles and values; God, family and country. And yet, there are those on our side who suggest that we kick Palin to the curb because she has become "too toxic." The field for 2016 is pretty crowded. I am not ready to select a candidate. However, if Palin throws her bonnet into the ring, my heart is with her 100%. He need a hero.